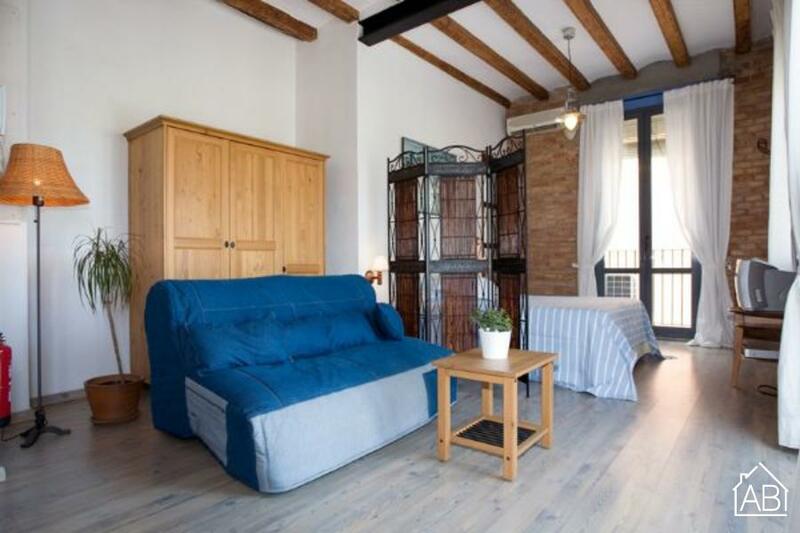 This charming one-bedroom apartment in Barcelona, located in Barceloneta is the perfect choice for you Mediterranean getaway. Situated amongst many beaches that are lined with bars, cafés and restaurants, as well as being a ten minute walk from historic downtown, you will have the city at your fingertips. This apartment is the ideal choice for couples or families and can accommodate up to three people. The interior of this space is quite remarkable as it has restored brickwork and ceiling beams, original wooden doors, and a brand-new wooden floor. With its undeniable Spanish charm, this locale will transport you back in time. The living room has a comfortable single sofa bed and a TV with satellite, perfect for relaxing after a day of sightseeing. The French window also allow access to a balcony where you can soak in the Spanish sun. The well equipped kitchen allows you to prepare your very own home-cooked meals, or try your hand at some Mediterranean inspired dishes. The apartment enjoys an open floor design, with a divider offering some privacy between the bedroom and the living room. The apartment is furnished with a comfortable double bed. The apartment has one bathroom with a walk-in shower. This charming apartment, complete with heaters and air-conditioning, is the ultimate choice for your trip to the Catalan capital, any time of the year.